Everything works for 32 bit client. Fresh prefix was used. Item icon in inventory and item on ground delay in 32 bit client. Use act ii town on 32 bit client. Go back for items as necessary. 64 bit client was not tested in this test set. Please note that due to bug #45443, Diablo III will work only in Wine Staging. The game will not launch in vanilla Wine (both stable and development releases) until the patch for this bug is integrated. 32-bit game client uses DirectX 9, while 64-bit client uses DirectX 11. For some reason the 64-bit client has abysmal performance (around 1-2 fps). In order to get around this and have a usable fps, either 1) use the 32-bit client, or 2) use DXVK (not directly supported on AppDB). Below workarounds should not be needed anymore to run the game. If you find that they are still required, please post it in the comments. Tested on Alllen and Heath Zed 10FX USB sound card. I would do a test result, but I'm not sure how this website really feels about installs patched massively... so I'll just post a comment instead. Using a patch pack like github.com/Tk-Glitch/PKGBUILDS/blob/master/wine-tkg-git/README.md with DXVK, esync (and Plasma tray fix) the Diablo 3 64bit client runs pretty much flawlessly for me in a prefix set to Win10 with esync enabled. Doesn't even have that weird issue I used to get where inventory items may take ~30 seconds to load properly. Just some FYI for those interested. I just realized that DVXK is mentioned in the notes for getting 64bit to work. Oops. 32 bit versions of the same above DLL files into the game prefix /Windows/syswow64 path, overwriting existing DLLs there as well. Subsequently, adding these DLLs as overrides to the WINE configuration for the prefix allows for flawless play of the game using the 64 bit client. I do experience some weird quirks with the Battlenet App, but turning off the option for "Allow the window manager to control the windows" in WINE seems to fix the Battlenet App problems for me (also using Windows 10 as the Windows version is a must). This continues to work with WINE 4.5 staging patched with DXVK version 1.01 for both 64 bit and 32 bit clients. No quirks. Continues to work with WINE 4.6 staging patched with DXVK verison 1.03 for both 64 bit and 32 bit clients. Narrowed down the winecfg overrides to only requiring the dx11 (native windows) override added. The other typical DXVK overrides are unneeded, but the dlls still appear to need to be copied over into their respective 64bit(/system 32) and 32bit(/syswow64) paths of the prefix. deactivate winecfg --> tab "staging" --> option "Enable CSMT for better graphic performance (deprecated)"
Has anyone tried or gotten this to work? The game runes flawlessly on 3.19 staging with DXVK .90 but if I try to install/use ReShade it just crashes on startup. I made it the last time with POL, but that doesn't work any more either. I was able to install the Battle.net client without problems. By running this command: sudo apt-get install p11-kit-modules:i386 p11-kit:i386 i also had no problems with the login-screen. It worked without problems (no missing graphics, no ugly buttons/login-fields). But then, when you hit the "Install" button it stops working. The window for the installation pops up, the waiting animation starts, but then nothing more. The animation keeps running forever. for whatever reason sometimes at first start of the BN app i get the install sconfig window shown, but hitting the "install now" button simply does nothing. 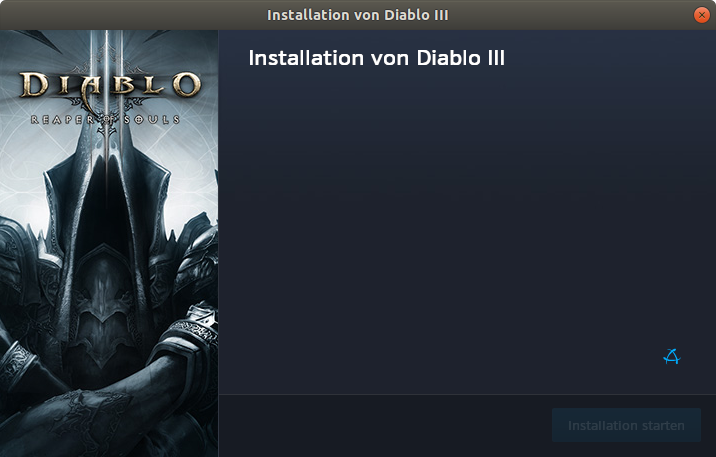 I tried some things, I deleted the Cache folder of Diablo and now it downloads the game. You will almost certainly encounter this issue in the future when updating games / the app. Unfortunately there doesn't seem to be any permanent way to fix it, you have to delete product.db file every time this happens. It begins with Wine 2.19 Staging and use Windows 10 as the Windows version. You will get the error message, and the login and password window comes up. Instead of logging in, click the settings gear icon and a dropdown menu appears, at the bottom of the dropdown, click Continue Without Logging In. This will get you to the option that will allow you to click play. After the game boots up, it will ask you for your login and password. This is currently working for me. I've logged in a few times to play. The success is repeatable. What is the issue that requires workaround? Most people seem to be able to launch D3 without problems through the Battle.net App. Also, Staging version 2.19 is really old – you should try with newer versions (e.g. 3.6). This will launch D3 directly, completely skipping BN App. DX11 very slow - any fix? I can play D3 with dx9 just fine by forcing 32bit. But with Blizzard dropping support for other games with DX9, I figure it is only a matter of time before DX9 will stop working altogether. DX11 however is 1 fps max atm, is there any fix for that? Has anyone tested the new wine-staging branch on Diablo III? Yeah, it works the same as staging 2.21, plus there are performance improvements from Wine 3.0+ (and no need to manually kill Battle.net.exe anymore). i think i stumbled on a another fix. can someone verify: I was having occasional mouse freezing in gnome. The mouse would click but not move. The suggested fix was to remove libinput and replace with evdev. I did that and it solved my mouse issue. I just tried in d3 and the problem seems to have gone away. running the lastest 2.21-staging. Now i dont know if there was a fix to wine-staging or the replacement of libinput. RE: i think i stumbled on a another fix. RE: mouse click not staying down. RE: i think i stumbled on a another fix. Mouse freezing only occurs for me in full-screen. Playing in Windowed or Windowed Fullscreen stops the bug from triggering. For me, in order to stop the mouse-downs-register-as-mouse-clicks problem in Diablo 3 2.6.1 with wine-staging 2.21, I had to recompile wine with the right patch. I'll attempt to explain how to do this here. replacing "../../wine-source" with the path to your wine-2.21 source. Note that you have to be in the wine-staging "patches" directory when executing patchinstall.sh. Step 4: Rebuild wine (both configure and make). Of the four above steps, the most difficult and painful, by far, is the first step, because you need to install lots of development stuff on your computer in order for wine to compile. But you ought to be able to complete all four of the above steps in half an hour or so, assuming you don't get lost. Hopefully, the patch "kernel32-SetFileCompletionNotificationModes" will start being included in non-staging wine soon so that we don't have to do all this in order to play Diablo 3. Well, I just tried playing Diablo 3 again after a couple of months away, and the patched wine I described creating in my previous message no longer works: Diablo 3 won't start. Blizzard has released more patches for Diablo 3. The current version is 2.6.1.49508; the patched wine I made in November worked with 2.6.1.47919. Apparently Blizzard made major changes to Diablo 3 between 2.6.1.47919 and 2.6.1.49508. I tried the latest wine, version 3.2, and it didn't work either. For some unknown reason, the latest version of wine-staging is still 2.21. I see that someone has posted three new bug reports (44585, 44616, and 44617) about the problem. Those bug reports seem to suggest that Diablo 3 2.6.1.49508 will work with a properly patched wine. I found that wine 2.21 with all but one of the patches in wine-staging 2.21 works. So I'm posting this message to explain how. This command line will, instead of adding the single patch "kernel32-SetFileCompletionNotificationModes", add all patches except "server-send_hardware_message". There's probably some minimal set of patches that will make it work, but I don't have the patience right now to figure out which ones. I hope this helps. > For some unknown reason, the latest version of wine-staging is still 2.21. The reason was announced here . Fortunately new maintainers took the project  an it has just been bumped to version 3.3 . You might want to check this new version to see what works and what doesn't. I am using it all the time, but I can't reproduce the mouse-down issue, so I don't know if it was fixed or just doesn't appear for me. I've just tested with the new wine-staging 3.3, and the problem is unchanged. With all patches included, the mouse-downs-register-as-mouse-clicks problem is present for me. If I leave out the single patch "server-send_hardware_message", then the problem does not occur. I used the unlimeted backgroudn and foreground FPS and the single Core command. Single click problems did not solve this way. In Addition I closed the battl.net app. Did not work neither. i am getting a bug that my char just stops moving when holding down button. Didnt have this issue prior to 2.6.1 of D3. I have gotten around the problem by using setarch and forcing 32bit and enabling virtual desktop in winecfg. Can someone confirm that they have the same issue? Running 2.20 staging. i should add it just stops at the last place i clicked instead of following the mouse. I did not experencie the problem you describe – my character correctly follows the mouse when it's held down. I'm running also on Wine Staging 2.20, with a 64-bit Win 7 prefix. I did however encounter the problem described in bug #31262, when I had Lock Cursor option enabled; I am now launching D3 without virtual desktop, in Windowed Fullscreen mode, and with Lock Cursor disabled, and I have no problems with mouse cursor. Maybe your issue is somehow related to display settings – what is your video configuration in D3? 3840x2160@60. I been using fullscreen, but will try the window and see if i can reproduce. i just tested with window (fullscreen) and it works much better. Never thought of using that. Thanks for the tip. I am also seeing this problem. Diablo 3 usually (but not every time) acts like I've clicked when I'm actually holding the mouse button down. I tried fullscreen, windowed, and windowed-fullscreen, and that didn't have any effect. I tried configuring wine with and without a virtual desktop, and that had no effect. I'm running wine-staging 2.20 with Diablo 3 2.6.1.47919. Okay, I've now tried all 16 settings combinations, and seen the problem on all 16 combinations. 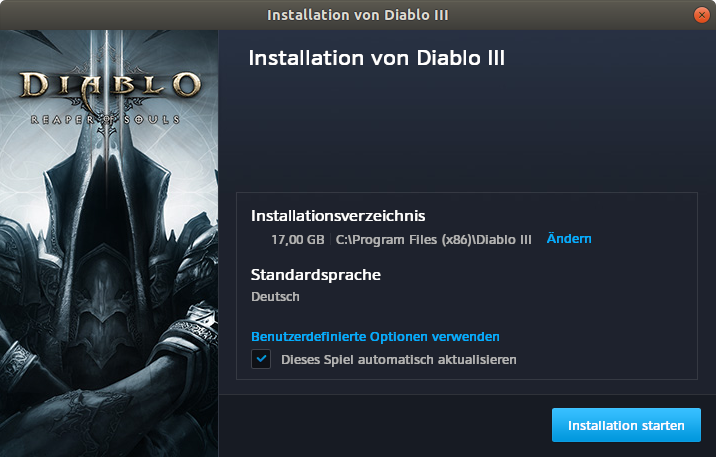 The combinations are: both with and without "setarch i386 -3"; with and without wine set to use a virtual desktop; Diablo 3 set to fullscreen, windowed, or windowed-fullscreen mode; and, for windowed-fullscreen mode, both with and without Diablo 3's lock-cursor-to-window option. After a great deal of work, I've found a workaround for this problem that works for me. The culprit seems to be the patch "server-send_hardware_message", one of the 440 patches that are part of wine-staging 2.20 and not part of wine 2.20. With wine recompiled without this patch, the problem disappears: my mouse-button holds register as mouse-button holds, not clicks. I also found that the only patches needed to make Blizzard app and Diablo 3 work with wine 2.20 are the patches "kernel32-SetFileCompletionNotificationModes" and its prerequisite "ntdll-FileNameInformation", and not the 438 other patches in wine-staging 2.20. Ive installed it and it works for 32bit but the launcher is very very slow. It seems that it only uses one of my six cpu cores. tried to install it on 64, but launcher doenst start after installation. Changes to removed XP support? Has anyone tried the PTR? Any changes we need to make? RE: Changes to removed XP support? I've been trying the PTR, and the past two patches, everything's been fine. They still list a lot of older video cards for recommended hardware (but have Windows 7 as the lowest version of windows), so I'm thinking dx9 isn't going away. I didn't try the PTR, i tried the live patch. Since XP support is droped the game doesn't start anymore in 32 bit mode. b) winecfg set to Win7 and above ... the game does nothing, not even the logo on startup. c) 64bit game still doesn't run smooth. it is VERY slow but it is starting. i habe a 64bit prefix too and use 2.19 staging, tried 2.17 before, the game was running perfectly until i got the patch. Have you maybe tried with a clean wineprefix? I'm also using 64-bit prefix on 2.19 staging with win7, and I have no problem running the game (although, like you said, the logo is not displayed – just after a couple of seconds the game launches). If it still doesn't work, is there maybe something interesting in the logs when you start the game directly? Or, do you have any dll overrides set (none should be needed for Diablo III)? Sure, i tried a new 64bit wineprefix too but my blizzard games are not installed in wine. i took them directly from my win7 partition. The games are all in their own subdirs on this mountpoint. As i could find out - the problem itself was hosted by the nvidia driver from the debian sid tree, as i updated this driver the last time i got also some bad performance in worldofwarcraft too. so i removed every sid package depending the nvidia driver and downloaded the latest original one from the nvidia website. after the install everything is running fine now as before the patch. could you explain how you did install that on 64? im trying it but it wont work. But was getting weird errors with winetricks. Found out, the version I had of winetricks was too old. then I did a : winetricks --force ie8 , and it worked. finally got Diablo 3 RoS to install and show up properly at the login screen for the game, however all attempts to log in give me the message "There was a problem logging in. (Code 7)". anyone happen to come across this here and was able to get past it? also I'm not able to log into battle.net at all through the Blizzard App client... is this normal? Diablo has been working fine for me, but I've never been able to see much of the stuff on the battle.net app which didn't bother me. Now that the necromancer is out, there is a promotional splash page on diablo 3's section of battle.net, which covers the play button. The problem is that the X in the top right corner used to close the promotion does not appear. I've tried clicking where it should be, messing with some settings, but I really don't know what to do here. using wine-2.8 and winetricks-20170614 on Slackware64 14.2, while also having installed corefonts, ie8, and vcrun2015 along with adding d3dcompiler_47 in winecfg. install went fine, however when I start the game I can hear the music playing however my screen is black. any suggestions? running nvidia 375.39 binary drivers as well. err:d3d:wined3d_debug_callback 0xa8cae60: "GL_INVALID_OPERATION error generated. Source and destination dimensions must be identical with the current filtering modes.". I've had quite some trouble installing the game and getting it to work. After figuring it out, I've noticed all is already well documented in Wine under Blizzard App. Don't forget to look there. After resolving all, mainly vcruntime140 and installing lib32-libldap, lib32-gnutls, everything works like charm :) great gameplay and performance. Enjoy.